December 28, 2013, 9:18 a.m.
2012 was always going to be a hard act to follow – the London Olympics and the Queen’s diamond jubilee dominated a summer that will live long in the national memory. Last year, 54% chose the Summer Olympics as the biggest story of the year and Boris Johnson, the politician most associated with the Games as the most popular politician. 2013 threw up a much wider array of stories, from scandals at home and abroad, ongoing conflicts and natural disasters from around the world. YouGov research for The Sun shows that that a wider range of stories dominated the news in 2013, but Boris remains as the county&apos;s favourite politician. 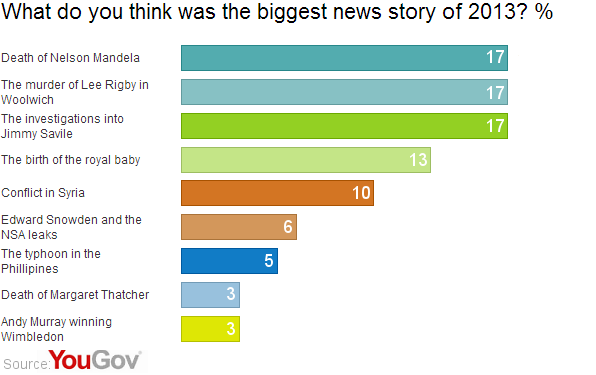 There is a three way tie for biggest news story of the year, the death of Nelson Mandela, the murder of Lee Rigby and the ongoing Jimmy Savile investigations were all chosen by 17% of the public. The birth of Prince George in July, which caused a global media frenzy for most of July is the next biggest story, chosen by 13%. This is followed by the ongoing conflict in Syria (10%), the NSA leaks (6%) and the typhoon in the Philippines (5%). For the second year in a row, Boris Johnson is the country’s favourite politician. He was chosen as the favourite politician of 2013 by 18% of the population, down from 25% in 2012, which was enough to beat Barack Obama (11%) into second place. Worryingly for the three main Westminster parties, Nigel Farage is the most popular party leader of 2012. 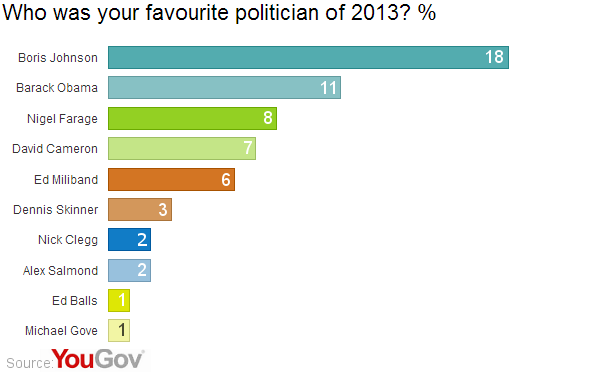 8% of Brits picked him as their favourite politician, ahead of David Cameron (7%), Ed Miliband (6%) and Nick Clegg (2%). Overall in 2013, the biggest stories came from a much wider range of sources than 2012; nonetheless, events and scandals rather than politicians and policies continue to dominate the news aganda in the eyes of the public.